My husband announced recently that he was going Keto. I’ll admit that I wasn’t exactly thrilled. 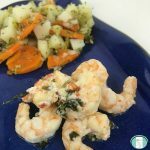 It’s hard enough to cook for a large family, considering the allergies and preferences without throwing a new diet into the mix! 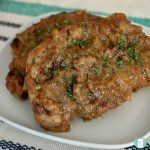 But I knew that if I could find some good make ahead keto meals, it would be doable. Almost all of our dinners are freezer meals. This enables me to make them ahead of time and have them ready to go. 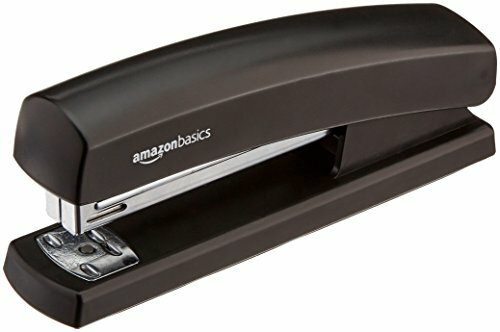 It cuts back on time and saves us a lot of money. Most of all, it saves me sanity because I never have to think, “what’s for supper?”! 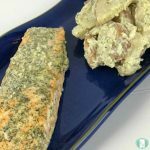 I knew that some of our staple freezer meals were already keto friendly, but I set about to find others I could use. 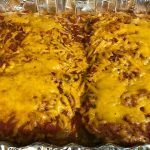 My husband has been doing a lot of reading about keto. One of the things that keeps coming up is that food prep is the key to success. I want him to be able to succeed with this, so I am on board with helping. We’ve had several friends have tremendous health results by going keto. I know how busy our lives are, so I realize that being prepared is the only way we are going to be able to make this work. 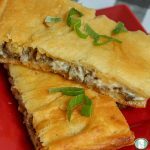 As I’m preparing another freezer meal assembly day, I’m putting together a list of make-ahead meals that are keto or can be easily adapted to be keto with just a small substitution or two. 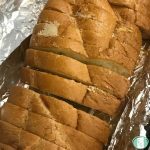 This list came about as a way for me to be able to support my husband with this lifestyle change and I hope that in sharing it with you, it can make things easier for you to get organized as well. 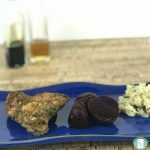 Keto is a high fat and very low carb way of eating. 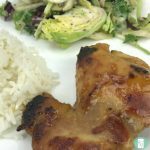 The keto diet aims to put your body into a metabolic state of ketosis. Bodies usually burn carbohydrates as their fuel. It is when you restrict the amount of carbs that you consume that your body can begin to break down stored fat. This creates molecules called ketones for the body to use as fuel. While many choose a keto diet for weight loss reasons, others choose it for health reasons, particularly reducing blood sugar and insulin levels. 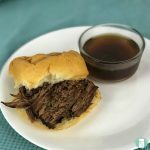 Beef Dip – Skip the bun and use lettuce or cabbage leaves instead. 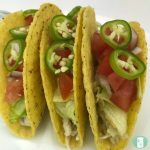 Instant Pot or Slow Cooker Salsa Verde Chicken Tacos – Use these keto taco shells or make it into taco salad. 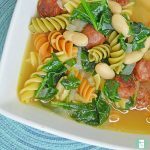 Italian Wedding Soup – Make without the pasta. 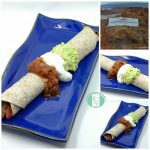 Beef Fajitas – When serving this, use low carb tortillas or cabbage leaves for wrapping. 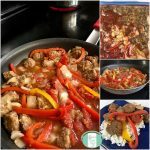 Stuffed Pepper Soup – Make this without the rice for it to be keto friendly. 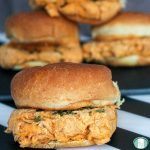 Droolworthy Shredded BBQ Chicken with Garlic Mayo – If you want to serve this on buns, there is a recipe for keto buns on Gnom-Gnom. 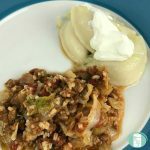 Cabbage Roll Casserole – Replace the rice with cauliflower rice. 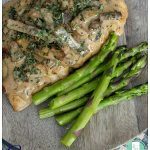 Easy Chicken Marsala – Make as directed, but without the flour. 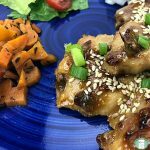 Chili Glazed Chicken – You’ll need to replace the honey for low carb sweetener like monk fruit or erythritol. 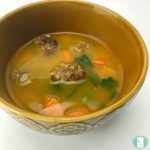 One of the tips that many on a keto diet suggest is to have bone broth on hand. It’s nutritious and good to have when the temptations for sweets hit. This Instant Pot bone broth recipe is a great way to get you started. 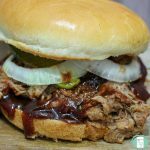 It’s easy and faster to make in the Instant Pot than on the stovetop. Once you make your bone broth, allow it to cool. Pour it into ice cube trays or a silicone tray and place in the freezer. Once the broth is frozen, pop the cubes out of the tray. 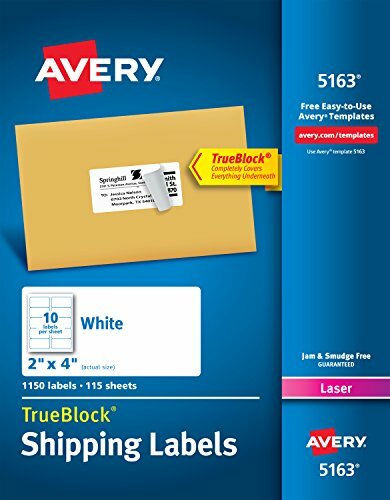 Place them into a large resealable freezer bag and seal. Place the bag back in the freezer. You will now have individual portions of bone broth that can be taken out whenever needed. Using this method, you can pull out enough for a small snack or for an entire meal. 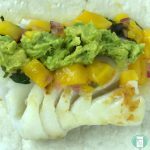 If you have favourite keto meals and aren’t sure what can be made ahead and frozen, you can read about what freezes well, what doesn’t and how to adapt your existing recipes. 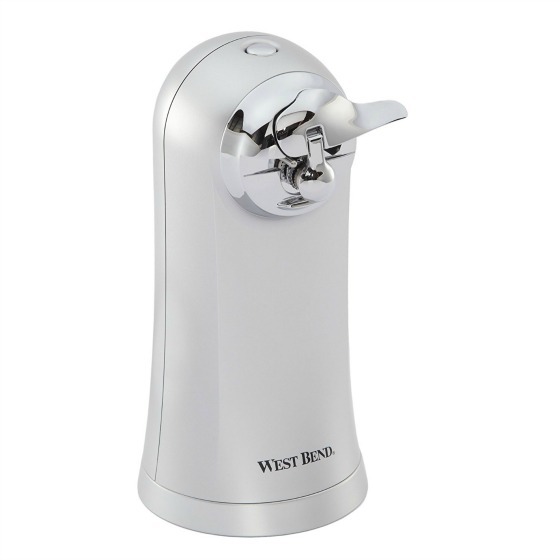 This will allow you to freeze your own best recipes and have them ready to go. 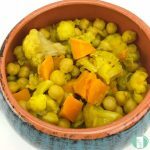 This Broccoli Cauliflower Salad isn’t a freezer meal, but it can be made ahead and kept in the fridge for up to 5 days. 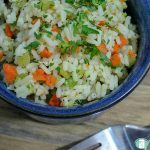 It’s great for lunches or to have as a side dish. 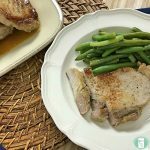 Brown ground beef or turkey and season with salt and pepper. Allow to cool. 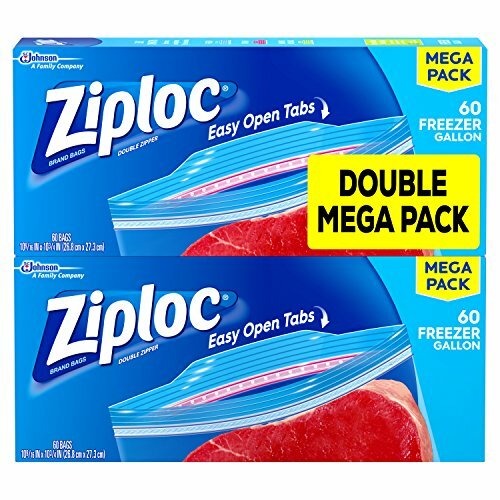 Fill medium sized resealable freezer bags. Remove the excess air. Freeze. This will allow you to pull out the bags when needed. Make stir fry bags and freeze them. 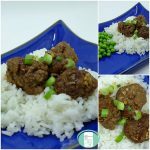 These are so quick and easy to cook up. 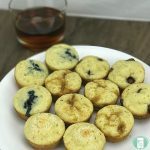 Bake keto muffins and freeze them for handy snacks. 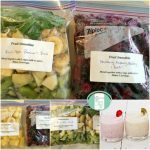 Smoothie bags in the freezer make for an easy on-the-go breakfast or snack. 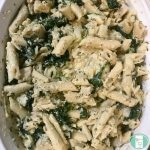 Be sure to include keto approved ingredients such as berries and spinach. Make keto pancakes ahead and freeze them. 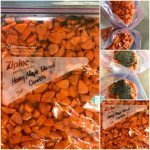 I find that freezing them flat on a cookie sheet first before placing them in resealable freezer bags makes them easier to separate later. 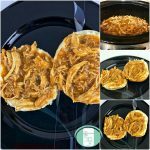 Grain free sausage and cheese biscuits can be frozen and then warmed up in a toaster oven. 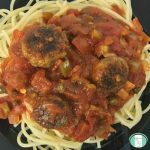 Low carb breakfast balls can be made ahead and frozen. Whip up a frittata and freeze (before cooking). 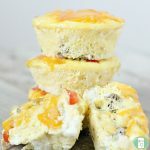 Then, simply thaw and bake in a casserole dish or bake individual portions using a muffin tin. 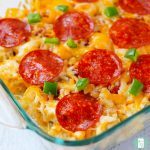 These meal prep sheet pan eggs can’t be made and frozen, but they can be kept in the fridge for up to a week, allowing you to have breakfast ready each morning. Please note that this is a very simplified version of the keto diet. You can find a more comprehensive list of what to eat on a ketogenic diet here. The Instant Pot is all the rage. Chances are, if you have one, you love it. 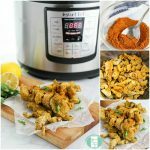 Once you try freezer meals for the Instant Pot, that love affair will be taken to a whole new level! Easy meets fast. They were a pair meant to be together. 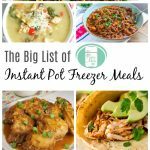 This easy guide to Instant Pot freezer meals will tell you everything you need to know to get started. You will need two things in order to get started. 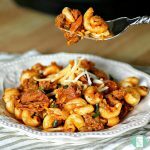 You will need an Instant Pot and freezer meals. 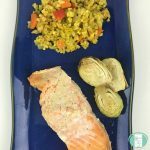 The Instant Pot should be chosen based on your needs. We have a large family (7 kids including some hungry teenage boys! 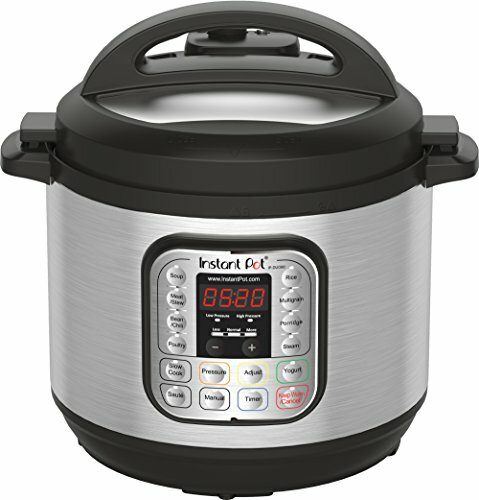 ), so I went with an 8 quart Instant Pot. The first step will be grocery shopping. Whenever you make many freezer meals at once, it always saves time to prep your ingredients before you start assembling. Once you’ve done that, it’s time to assemble the meals. 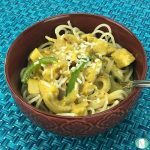 One of the nicest things about the Instant Pot is that you can cook from frozen. 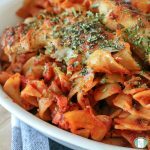 This is particularly good for those of us who sometimes forget to take out a freezer meal to thaw in the morning or the night before. 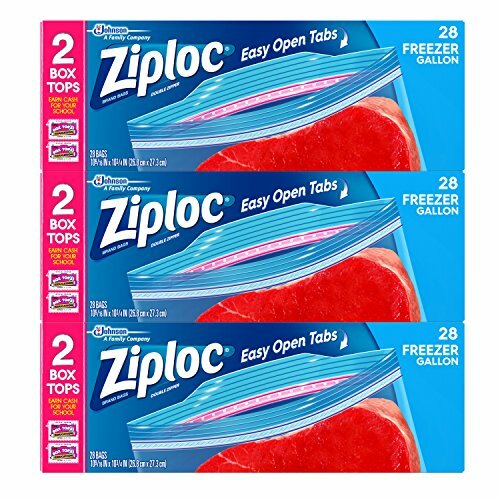 I freeze most of my freezer meals in large resealable bags. 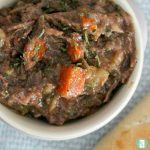 If they are frozen solid, their rectangular shape doesn’t lend itself well to being put into the round Instant Pot. This poses quite a conundrum. 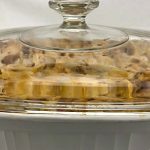 If you want to place the meal into the Instant Pot completely frozen, the best trick I’ve heard is to make the freezer meals in empty ice cream pails or similar sized round plastic containers. 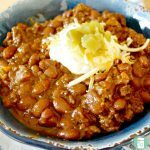 That way, they can fit directly into the Instant Pot, no thawing needed. The downside to freezing the meals in pails is that they take up a lot more space in the freezer. I like that resealable freezer bags can be stored flat. That way, I can fit several months worth of meals in the freezer. There’s an easy fix to the space dilemma though. 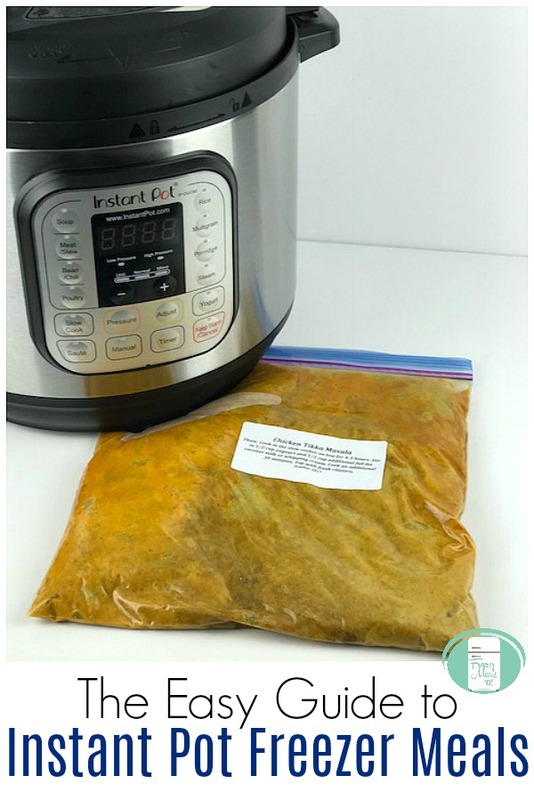 Just place the freezer bag in lukewarm water for a few minutes to thaw it enough to get the contents into the Instant Pot. 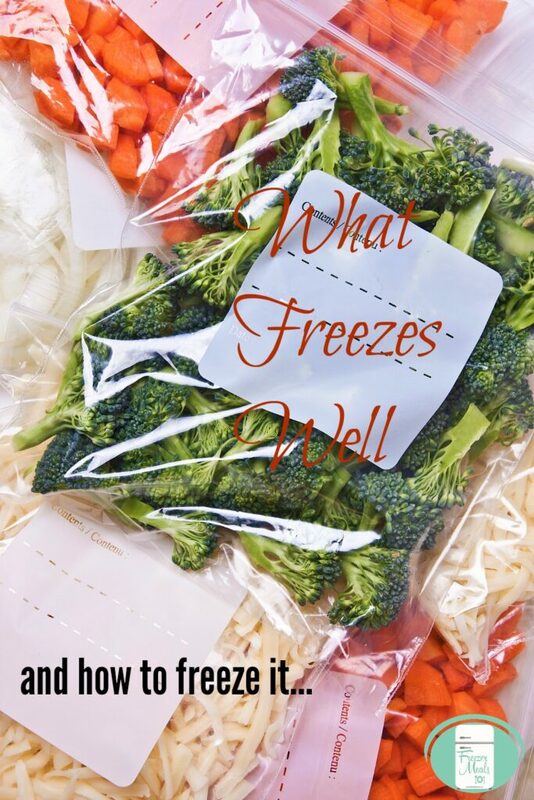 With freezer cooking, it’s important to know what freezes and what doesn’t. Read a full list here of what foods freeze well and which don’t as well on tips on how best to freeze them. I’ve created a cheatsheet for you to print out as an easy reference to remember what freezes well. Freezer burn is the enemy of freezer meals. The good news is, you can prevent freezer burn by taking all the excess air out of the freezer bags before sealing. Label your bags with the date so that you can track which ones to eat first. Only fill your Instant Pot 2/3 of the way full. 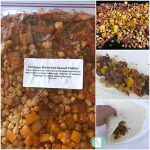 For recipes that will expand, such as those that contain beans or rice, fill it no more than 1/2 full. I have made the mistake of overfilling and then out of the pressure nozzle came a FOUNTAIN of liquid. It covered my counter, my floor, my cupboards. Some of it even got on the ceiling. You had better believe that I never made that mistake again! If you are cooking your meat from frozen, you will need to add some time to the recipe instructions. It will take longer to come to pressure from frozen. 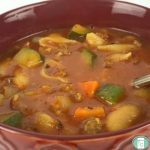 If you are adding the whole freezer meal in completely frozen, then you will either need to add a bit of water or turn on the saute setting and allow to cook for 5 minutes before sealing and cooking. This is to create some liquid. A pressure cooker needs liquid in order to do what it needs to do. 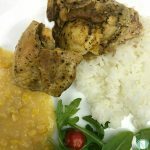 Use your judgment about which recipes to add water to as it could affect the final meal. A soup for example would be fine to add a bit of water to. 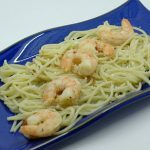 Recipes that are not intended to be watery wouldn’t fare as well. For those, use the saute idea. 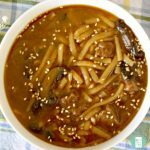 You will of course need to have an Instant Pot. 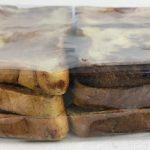 You will also need good quality resealable freezer bags or empty ice cream pails, and permanent markers or printable labels for labelling the meals. 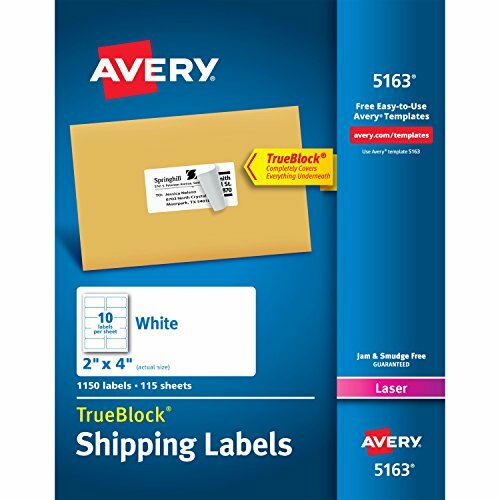 I use Avery 5163 labels. 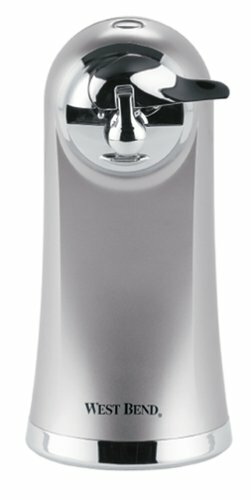 I strongly suggest that you also invest in an electric can opener. I wish I had gotten mine sooner. When you are opening dozens of cans in a day, it wears on your wrists and thumbs. It also eats up precious time. 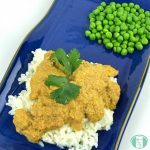 Many of our favourite recipes are freezer to crock pot recipes. 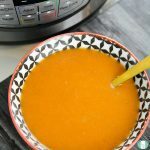 If you want to use one of those recipes in the Instant Pot, you can, but you will have to adjust the times significantly. 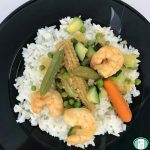 Things cook much quicker with pressure cooking. 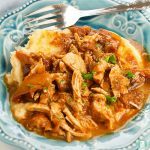 In a slow cooker recipe that calls for 8 hours of cook time on low (4 hours on high), the cook time in the Instant Pot in the sealed setting will be 25-30 minutes. You will of course need to allow extra minutes for the pressure to release. 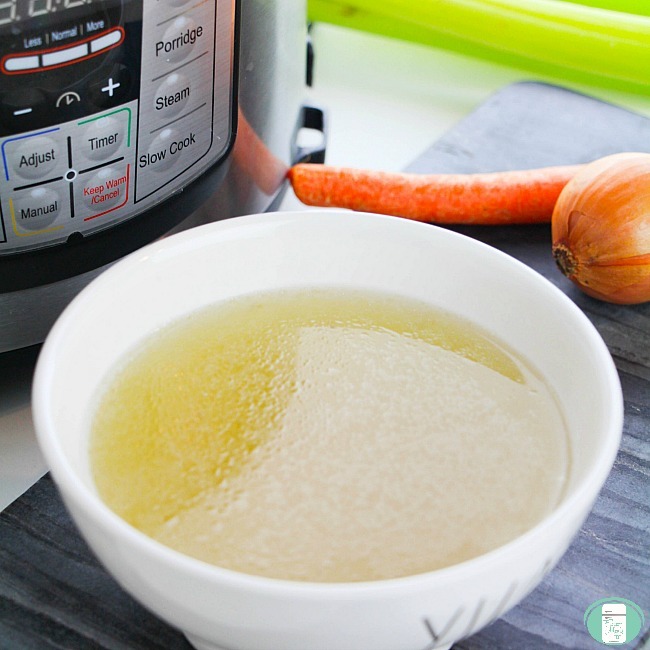 Instant Pots need liquid to cook things properly, so if your original recipe doesn’t have at least one cup of liquid (this can be broth, sauce, water, etc. ), you’ll have to add some. 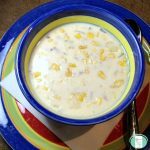 Don’t add freezer to slow cooker recipes that have milk or dairy in them (condensed or evaporated milk is ok). You can add the milk or dairy in at the end, but because of the high pressure, you don’t want to include them for the full cook time. 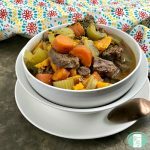 One last note about this: Instant Pots can also function as a slow cooker, so if you only have an Instant Pot, it’s easy to use your crock pot recipes in there using that feature. 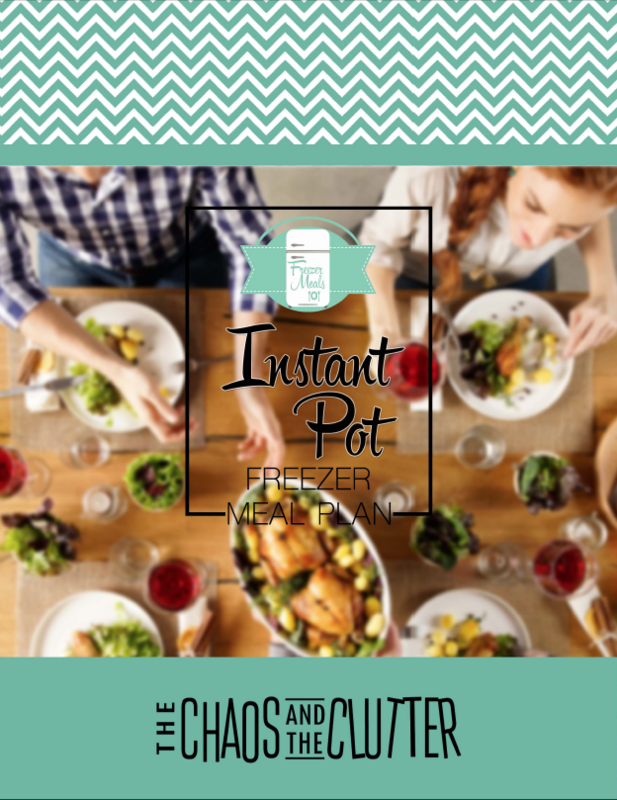 Find freezer to Instant Pot recipes, shopping lists, prep lists, and printable labels in our Instant Pot Freezer Meal Menu Plan. These freezer meal hacks are little tricks that will make freezer meal assembly even easier. 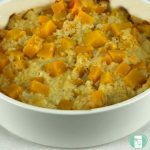 They are great for using anytime, but when you’re doing a marathon freezer meal session and assembling dozens of meals, the small tricks make a BIG difference. 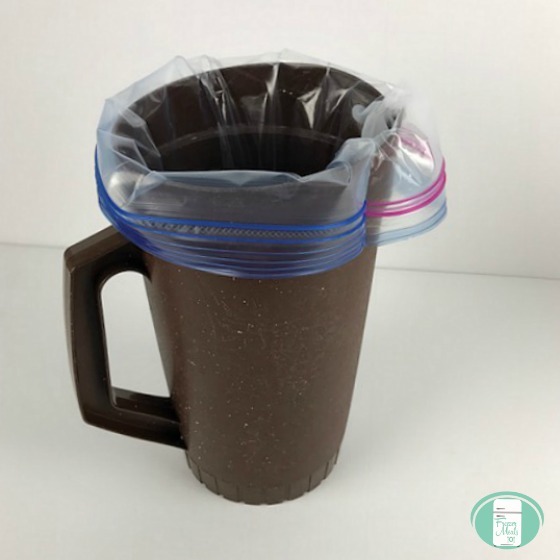 Use plastic containers or juice jugs to hold open large resealable freezer bags instead of buying the fancy holder-upper things. 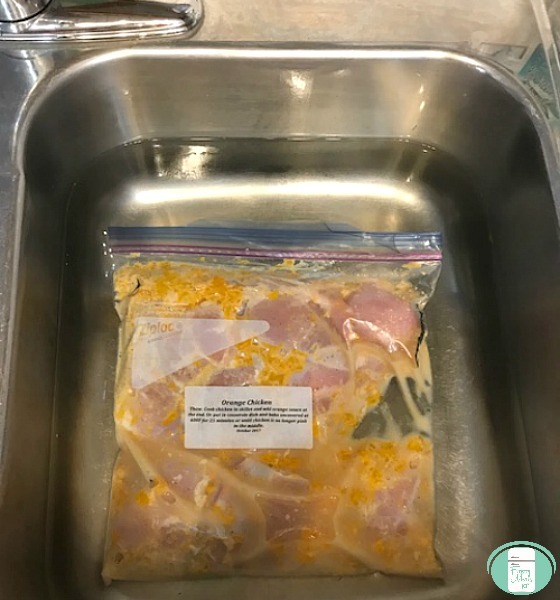 If you forget to take a meal out of the freezer in the morning, you can thaw it quickly by placing the bag in a sink or large bowl full of warm water for 20 minutes. Freeze leftover wine in ice cube trays. 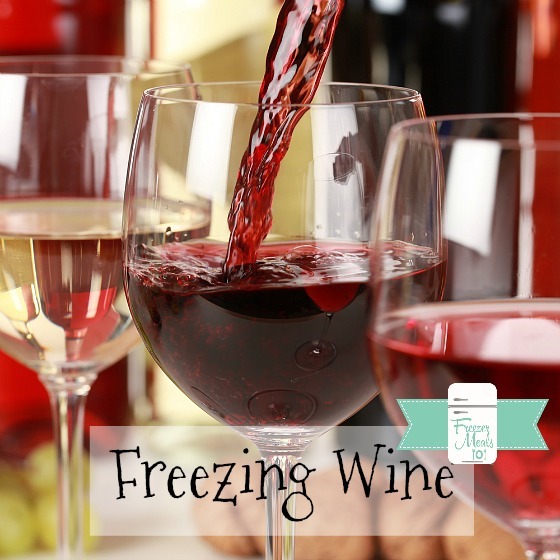 Once frozen, add the wine cubes to freezer bags and keep frozen. 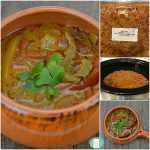 Use in soups, stews, chilis, and pasta sauces for more depth of flavour. Put dates on your freezer meal labels. This lets you know at a glance what order to use the meals in. 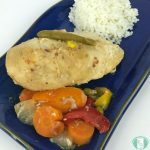 Most meals keep in the freezer very well for 3-6 months and some even longer. Buy ground meats when they are on sale. 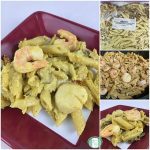 Fry them up and freeze them in one pound portions to use in recipes. 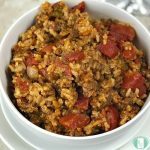 This works with ground beef, ground turkey, ground sausage, and ground chicken. If you’re going to be assembling freezer meals using ground beef, put 20 – 30 lbs of ground beef into a large counter-top electric roaster and let it cook on 200/250° overnight. By morning, it’s ready to go! You’ll need to use a ladle to take out the excess liquid. 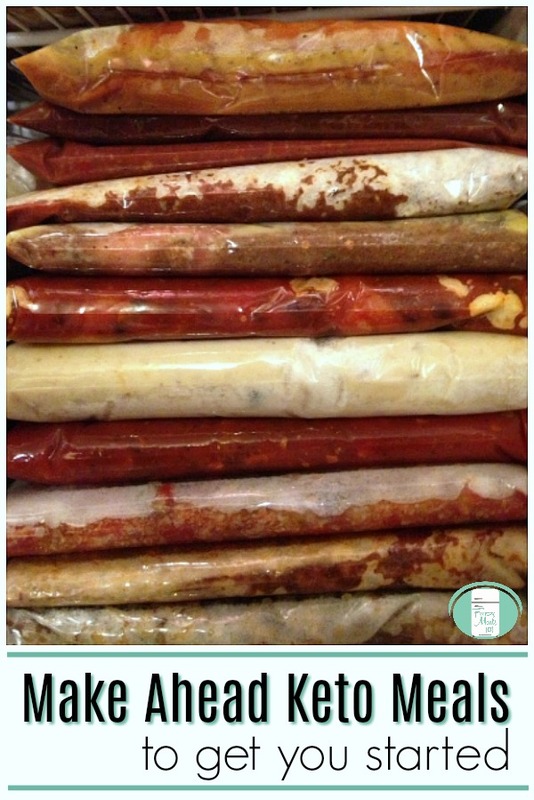 This tip (and picture) is from my friend Kimberly Walker, a mom of 10 and freezer meal veteran. When a recipe calls for 1 pound of ground beef, that is equal to 2 1/3 cups cooked ground beef. Knowing this makes it so much easier to assemble freezer meals. Pick up your free cheatsheet for what freezes and what doesn’t here so that you never have to wonder again. 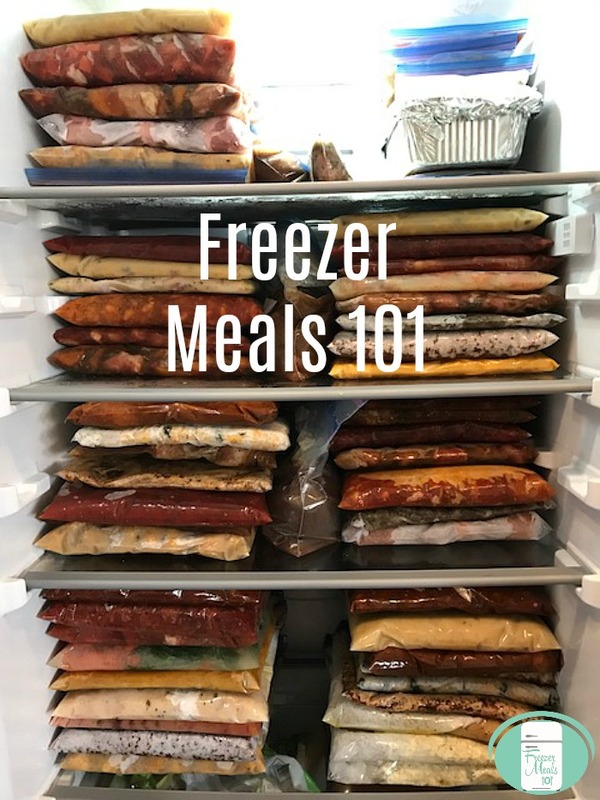 If you don’t have a standup freezer, you’ll want to first freeze your meals flat and then put them upright in the freezer like books on a bookshelf to maximize space. Use pre-planned freezer meal plans that include printable shopping lists and labels to save you time and sanity. 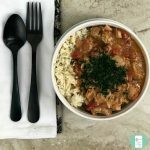 What are your favourite freezer meal hacks? There is nothing quite like standing back at the end of a freezer meal day and admiring the stack of meals. 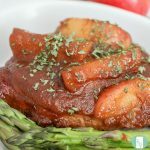 Knowing that you won’t have to cook supper again for days, weeks, or even months is one of the best feelings in the world! 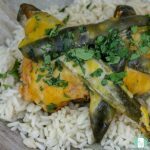 Having meals made ahead is already such a time saver, but these little freezer meal tips add up so they will make you even more efficient. Clean your kitchen before you start. 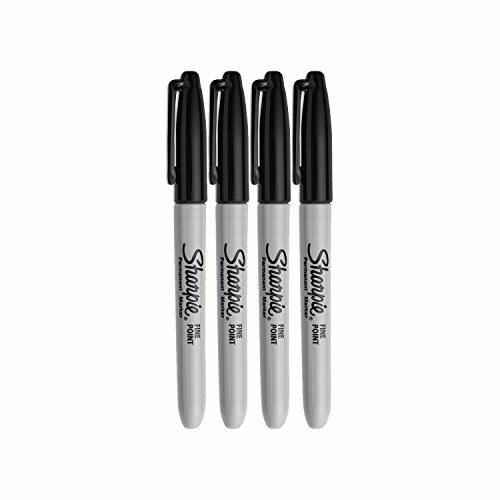 This may seem obvious, but starting with a clean canvas will make clean-up less overwhelming later. 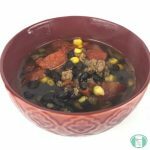 Make room in your freezer before you begin so that you’ll have room to put all of those great new meals you’ll be making! Invest in an electric can opener. I cannot stress this enough. I wish we had gotten ours years sooner. 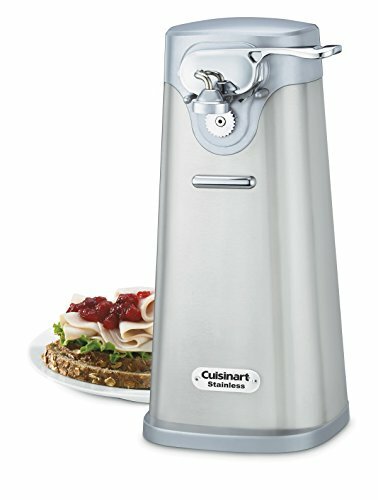 When I think of all those freezer meal days where my wrist and thumb were so sore by the end of it, I can’t believe I didn’t make the small investment in a good electric can opener sooner. It’s also a huge time saver. Another bonus is that my kids love operating it. Opening cans is an easy way for my kids to feel involved and makes one less thing for me to do. During your prep and while you assemble your meals, wear comfortable shoes. This is another tip that I cannot stress enough. This will be the difference between having very sore feet, shoulders and back and not. I even use an anti-fatigue gel mat in the kitchen by the sink for all the standing I do that day. Make a good, energetic playlist for your freezer meal day. Good music helps the time go by faster and keep your mood upbeat. 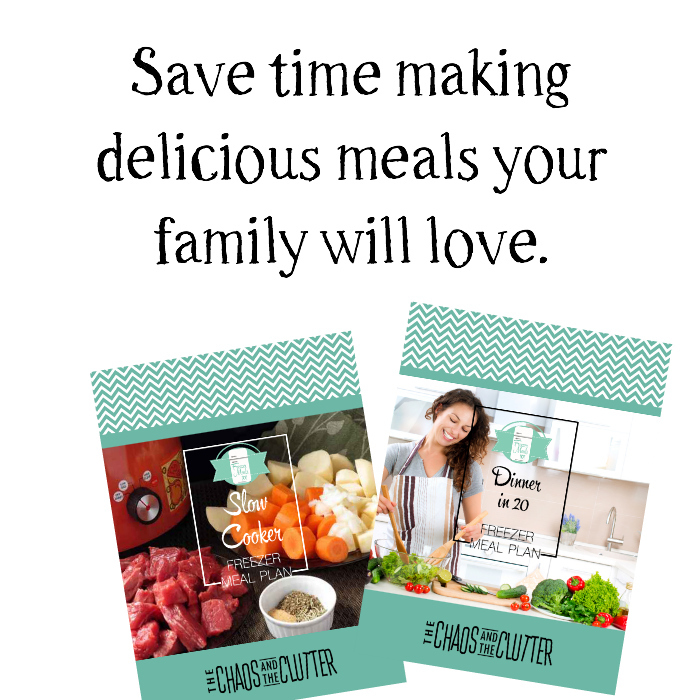 Choose a friend to make freezer meals with or even a small group of friends. This helps the time go faster and maximizes your time. You can assign people to “stations” and have them assemble a large quantity of the same recipe. This also makes the experience a lot of fun. I make my freezer meals with my friend Christie, who also happens to be my neighbour. We get so much visiting in while we make our meals and we’ve gotten such a good system going that we just keep getting faster and faster. 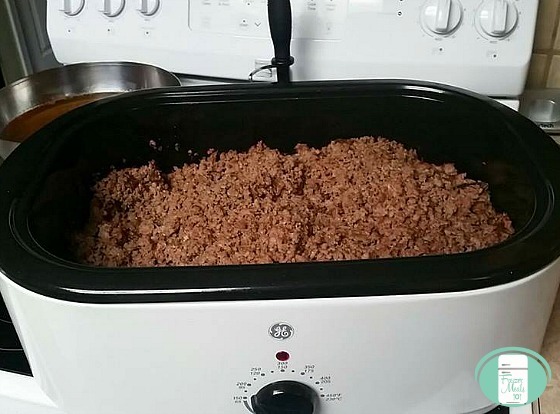 For ground beef freezer meals, put 20 – 30 lbs of ground beef into a large counter top electric roaster and let it cook on 200/250° overnight. In the morning, it’s browned and ready to use. 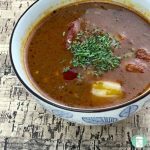 You’ll need to use a ladle to take out the excess liquid or drain the meat. 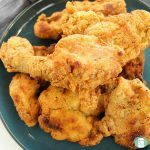 This tip (and picture) is from my dear friend Kimberly Walker, who is a mom of 10 and a freezer meal veteran. 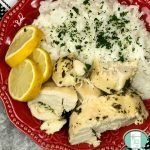 For recipes that call for cooked diced chicken, bake chicken breasts on a cookie sheet at 350° for 45 minutes and then chop. This allows you to cook a lot of chicken at the same time. Use printable labels and add the date to them so you can see at a glance which meals to use first. 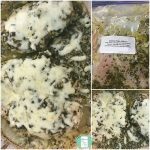 A freezer meal inventory sheet can also be useful for this. 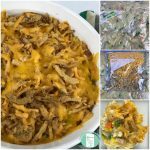 Dump recipes are the way to save the most time when assembling freezer meals. 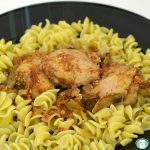 You can easily make ten meals in an hour or less. 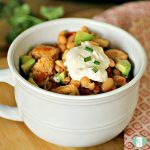 The downside of course is that there is less variety than using a freezer meal plan, but for speed, they just can’t be beat! If you’re making dump meals with a friend, have one of you fill the bags with the protein while the other makes the sauces to pour in. This makes things go even faster. Track your progress as you go and celebrate the victories. 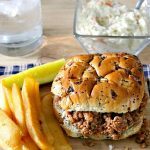 When you’re in the thick of a big freezer meal day, it can be easy to lose sight of why you’re doing it. You may start to feel discouraged. You can choose to keep track of your progress by crossing the recipes off a list or by keeping a tally sheet. At the end, celebrate your accomplishment! 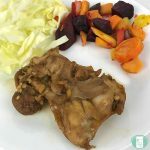 You can do this by giving yourself a treat such as chocolate or a glass of wine or going out for dinner with a friend, particularly if you and the friend made the freezer meals together. 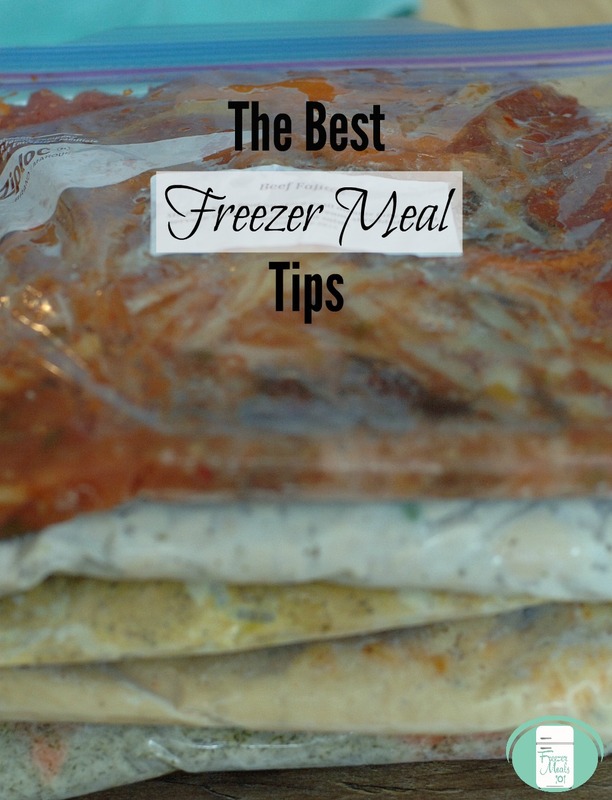 Hopefully you’ll find these freezer meal tips helpful. 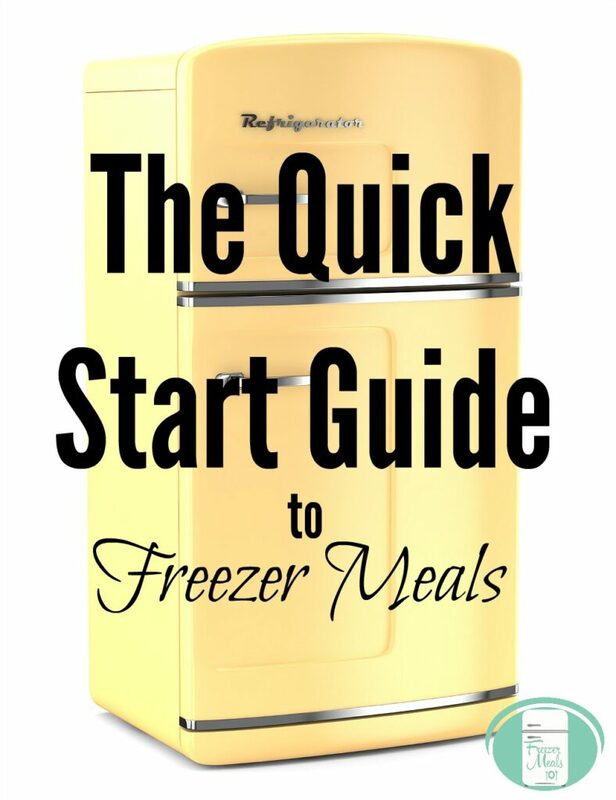 If you’re new to freezer meals, you might want to read The Quick Start Guide to Freezer Meals. 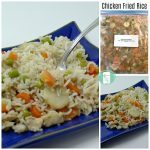 You can also check out our library of freezer meal recipes.